Sometimes the behavior of the chicken says that she wants to hatch eggs demolished. She Dotes and tries to sit on them. You need to create her to process. It is desirable that the nest for the hen was in a far dark place the coop or otherwise reserved for vysadki place where it will not interfere with other birds. For equipment socket you can use a plywood Board size is about 70*70 cm After the nest is ready, it should be placed away from the feeders and perches. If you will be planting not one chicken, it is best to isolate each socket from the other chickens special grid-partition. Feed and care for these chickens also need apart from the others. 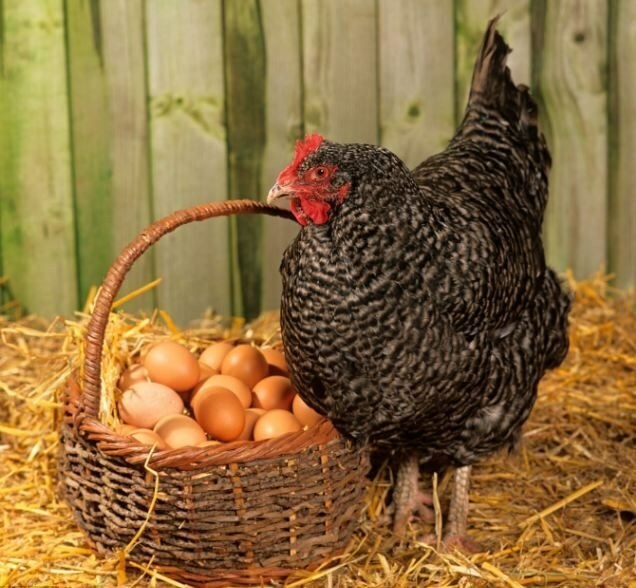 Before you put the chicken on the clutch, it is necessary to place 15-20 eggs, the number of the latter will depend on the size of the chicken. Definitely need to make sure the eggs were warm and fresh. To put eggs straight from the fridge it is impossible in any case! Periodically, you need to check that the eggs were warm and intact. If discovered broken eggs, they should be replaced, but only in the first few days. The process of planting takes 21 days, while eggs must have a temperature not less than 37.8 per OS. So the egg is evenly heated, the chicken periodically flips its paws. Without the hen eggs can stay for 2-3 hours, and at the end of incubation even 24 hours. The best time to put a hen on a clutch – evening period, or rather after the evening feeding. You should bring the bird into the nest and cover it with the basket. The first time a hen let out every day for feeding, and its diet must contain whole grain and pure water. In four days you can already remove the basket of eggs she will not leave. At the time of planting the chicken fast enough eats and goes, as does not leave the eggs for a long time. If hen is the first planting, it is necessary to observe that it is not pecked chickens. The chicken can damage eggs and even kill Chicks. It may be necessary to pull the chicken out of the shell, this should be done very carefully, can damage his cord. Then you need to include chicken in the house, in a warm place, give it to dry, to get stronger and try to feed. Sometimes it happens that a hen pushes an egg to the side, it says that there is no embryo or chick measurements, such eggs should be immediately removed. Good results litter depends primarily on the quality of eggs selected for hatching, as well as the health status of the hen-specific in turn from the feed and the conditions of poultry.